I have to be honest when I tell you that I have had great success and great failures when it comes to using yeast. As I do with the rest of my cooking/baking I always tend to add a little dash of this or change the recipe to my liking. This has most definitely been my down fall when it comes to using yeast. This past year I decided I wanted to conquer my fear of this stinky peculiar product and time and time again I became more fearful. After failed cinnamon buns, loaves of bread and the worst looking buns you have ever seen, I was even more determined to get things right. I followed recipes absolutely perfectly and although it was against my will, I did not add even the slightest bit piece of personal opinion. After trial and error I figured out where I was going wrong: Letting the yeast proof too long, adding flour/various ingredients at the end of the kneading process and punching the dough down after the last rise prior to the baking process. Of course I also determined that there is a time and a place when there are exceptions: this is where I was thrown a curve ball in the past! 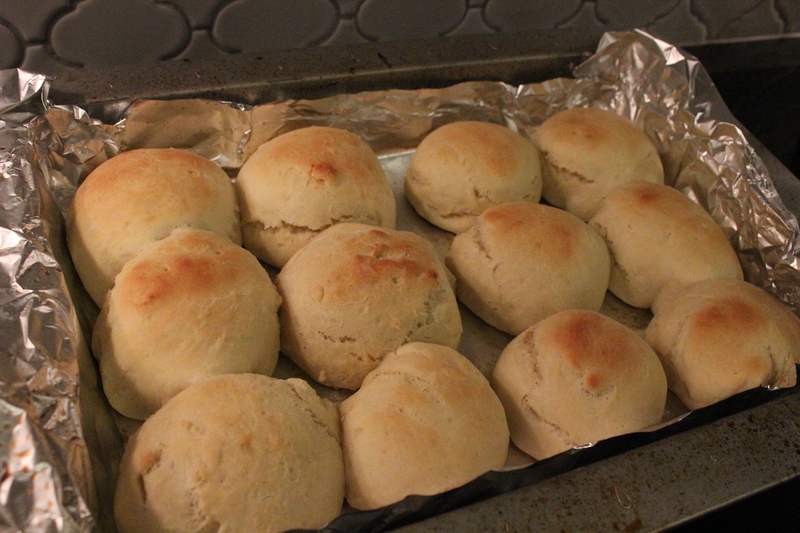 This past week I have rocked pizza dough and dinner buns and questioned myself throughout the entire process. Below is a recipe that I came across after making soup and deciding that I wanted some delicious warm buns to go with it. 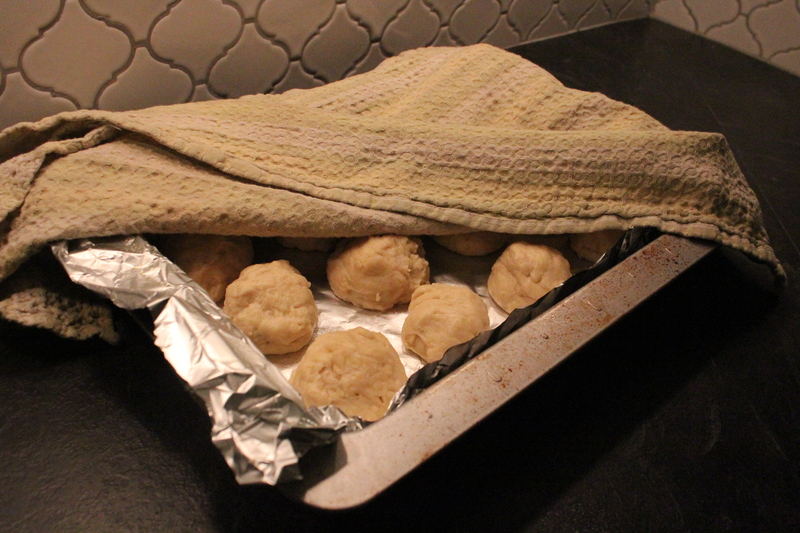 After scouring the internet I came across a straight forward plan for exactly what I wanted: dough that didn’t need to sit under a cloth in a warm place for hours on end, but could be ready from start to finish along with the rest of our meal. Preheat oven to 400F. Mix water, oil, yeast, and sugar together in the bowl of an electric mixer and let it rest for 15 minutes. Add the salt and egg, mix thoroughly. Gradually add the flour. Divide into 12 equal pieces, and shape into round balls. Place onto a greased baking sheet and let it rise for 10-15 minutes. Bake 10 minutes or until golden brown. Fear #1: The buns didn’t seem to rise that much on the greased baking sheet after 15 minutes (I did place them beneath my under cabinet lights since its winter and our home is a little on the cooler side). My worrying was definitely in vain. Fear #2: After 10 minutes the buns were not even brown – I was afraid I was going to cook them too long, but I did end up adding an additional 7 minutes to the timer and the tops were slightly brown, but the bottoms were quite dark. Below are the buns prior to rising for 15 on the baking sheet (beneath the under cabinet lights and a tea towel – I still don’t know why I cover them with a tea towel, but I do it because all of the other recipes have called for it). 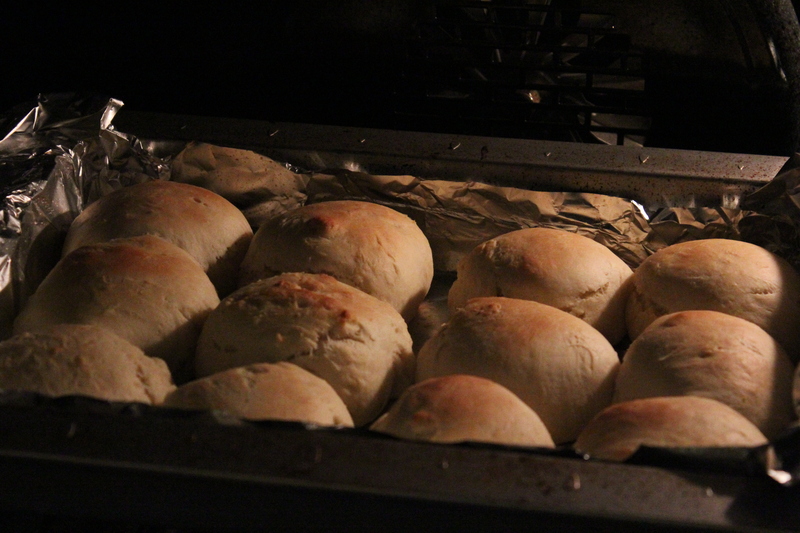 Here are the bins after 15 minutes, they did rise slightly, but I thought that they were supposed to be fully risen prior to cooking, I didn’t realize that in the oven they would rise that much more. At this point I put them in the over with the timer on for 10 minutes. I peeked in on the tiny little buns progress every minute and after 7 minutes I saw significant growth, but the colour wasn’t yet close to brown. I figured there was no altering things now – such as adding more yeast or kneading again, but I had to add some time, I wasn’t about to serve raw yeasty dough. It was a trying process and my patience was given a chance to grow, but after 7 extra minutes they came out perfectly.